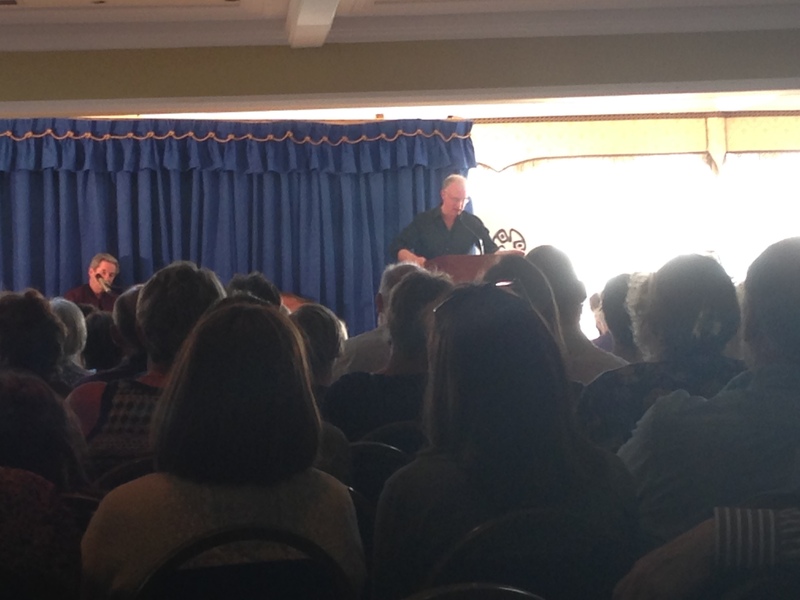 So, by pure chance I got to see Joseph O’Connor at the Listowel Writer’s Festival in beautiful Listowel, Co. Kerry, Ireland back in May. But this makes it sound like a Bigfoot sighting. Well, this Bigfoot stood in front of a room of a couple hundred people or so. He talked a little bit about the way he writes, the way he wrote his last three or so novels (Star of the Sea, Redemption Falls, Ghost Light, The Thrill of it All) — which was painstakingly slow, audible, and meticulous. It was a great relief to those sitting on the other side of the podium that those books didn’t just pour out of him like some unstoppable torrent of beautiful whole cloth prose. And so he talked, he read aloud from his new book, and then adjourned to the back to sign books and meet and greet the punters. Thankfully I’d thought to bring my bodyguard and number one bulldog along, who barged us ahead to nearly the front of the line. They didn’t think to give Joseph a table or chair or bodyguards of his own — perhaps the flak-jacketed, Uzi-toting sentries at American book readings and signings don’t translate overseas well — so he stood at the back of the hall, awaiting the queue like a Bigfoot at the DMV. My bulldog/bodyguard prepped me — Don’t sound like a fool when you step up to meet Joseph O’Connor. I can’t tell you whether or not I succeeded. All I can tell you is I told him about Aer Lingus going on strike and causing us to miss our flight and be able to attend this Bigfoot sighting. At some point I wasn’t talking to the Bigfoot any more, having retired, or been retired, by my minder, to the Listowel Arms’ hotel bar. She patiently waited for me to regain consciousness. And I did, eventually. But that’s not *all* of the story. 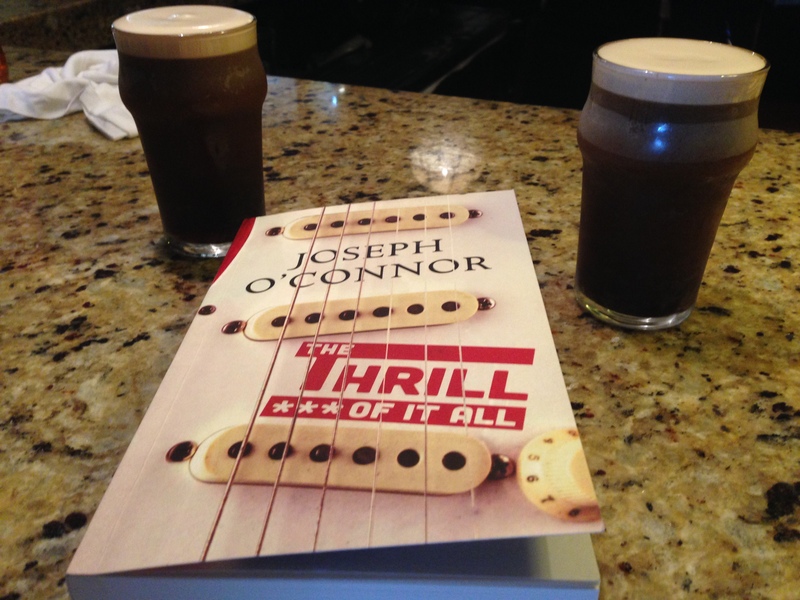 When I recovered my senses (I would say it fell short of a swoon), I marveled at my newly signed copy of Joe’s new book, sipped my glass of Guinness, fraternized with my minder. After a time, as was our wont, we left the bar, headed for some night air when who should we spy, in that same night air, but Joseph O’Connor, erstwhile Bigfoot, brother of Sinéad, vanquisher of empty pages. “Invite him in for a drink,” said my minder in an uncharacteristically permissive mood. So we approached. The man stood, still, as if he resented ever bending his legs, given that his profession likely involves lots of that, smoking a cigarette, as you’re still allowed to do in Ireland. I was about to hail him with something no doubt witty, despite my minder not giving me the timely reminder to not sound like a fool, when Anne Enright, eminent Irish author and resident, leapt out of a nearby tree, or possibly flew down from the ramparts of the hotel. She wore a purple cape, stood about five foot even, when she landed, and was also smoking a cigarette. “Ah!” I exclaimed, whether of fright or delight, I can’t tell you. “Ah, this is Anne Enright,” said Joseph O’Connor. I nodded. The great intertwined Æ emblem emblazoned on her jumper made that bit more sense, then. She said somethings which traveled far too fast, far too erudite for me to catch. Puffed on her cigarette. I goggled. “Oh! You’re American,” she said. “The Americans know me.” She gave Joseph O’Connor a knowing look and a nod and pulled on her cigarette. Looked warily around the courtyard, the street, as if looking for trouble. “Oh!” My minder poked me. I had also been scanning the street for trouble, purely out of peer (or if not peer at least proximal) pressure. Looked at my minder, at a loss as to what the poke meant. “I… umm.” The cape was distracting, as was the way it wafted on a nonexistent breeze. “Oh. Would *you* like to, ah, join us for a drink?” I also realized I hadn’t asked Joseph aloud to join us, so I turned to him and awkwardly bowed in a way that I suppose meant that the question was also for himself. 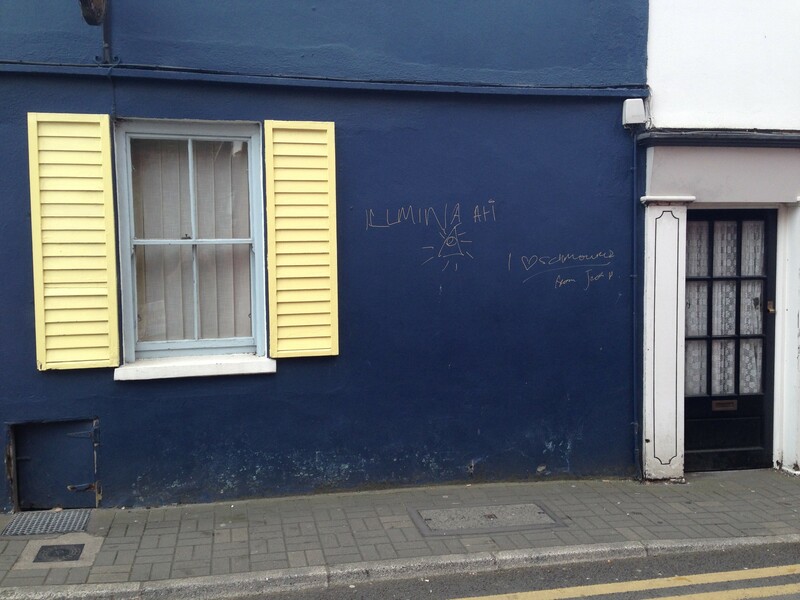 Anne Enright shook her head solemnly. The cigarette flung its ash in a small arc. Joseph was also shaking his head. “Maybe later,” they said, “we’ll see you in there. But for now…” They looked at each other, stubbed out their cigarettes and flew off into the still bright Irish night air. 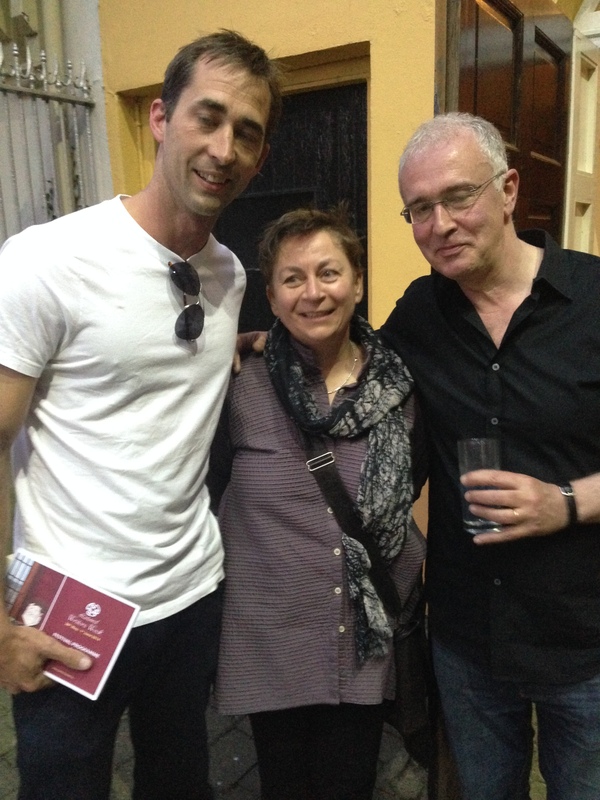 The author, Anne Enright, and Joseph O’Connor. Not drunk, I swear. Thought I heard them discussing the hassles of moving house in the Dublin suburbs as they receded into the distance. As we watched them fly out of sight, Kevin Barry emerged from the shadows of a bush people had been pouring the remains of their drinks and spent cigarette butts into. He cackled like a madman and wore a gravity-defying mask. He scuttled towards the hotel, but was tackled before he could get to the door by a spry David Mitchell, who apologized for butting in, being English, but he lived just down the road, you see. Kevin Barry was tumbled into the open door of a gray van, which appeared to have the ghost of Seamus Heaney at the wheel, a disgruntled John Banville/Benjamin Black seated in the passenger seat.